Ed Webster in 1988 on the Pang La pass,Tibet, en route to Everest's East Face. Born on March 21, 1956, in Boston, ED WEBSTER grew up in Lexington, Massachusetts and obtained a bachelor's degree in anthropology from Colorado College in Colorado Springs in 1978. Married, he now lives in Maine, and is an acknowledged expert on the history of Mount Everest, George Mallory, and Tenzing Norgay. An author, lecturer, publisher, and photojournalist, Webster also has written two definitive guidebooks, Rock Climbs in the White Mountains of New Hampshire and Climbing in the Magic Islands to the Lofoten Islands of Arctic Norway. He is the recipient of the American Mountain Foundation's 1988 Seventh Grade Award for outstanding achievements in mountaineering; the American Alpine Club's 1990 Literary Award; and American Alpine Club's 1994 David H. Soules Award, for saving the life of a fellow climber. Webster is one of only three mountaineers cited in the board game, Trivial Pursuit -- his Everest frostbite injuries being duly noted in the "Best of the 80s" edition! 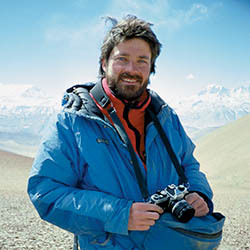 His photographs have been published worldwide, in publications ranging from Climbing Magazine and Rock & Ice, to Popular Mechanics, Rolling Stone, and the New York Times Sunday Magazine. His 1988 Everest Kangshung Face new route, climbed with Robert Anderson (USA), Paul Teare (Canada), and Stephen Venables (UK), has been hailed as the last of "the great" Everest expeditions, and one of the most audacious mountaineering feats of all time. Many mountaineers dream of climbing Mount Everest or Chomolungma, the Goddess Mother of the World, as Tibetans and Sherpas call her. But American climber Ed Webster wanted to summit the world's tallest mountain in the absolute purest and best style that he could dream of - up a never-before-attempted route, with no bottled supplementary oxygen, without using radios, and with no Sherpa assistance. With a team of four. Up Mount Everest's hardest, most remote, least explored -- and possibly its most dangerous side -- up the 12,000-vertical-foot-high Kangshung Face in Tibet. . . . . 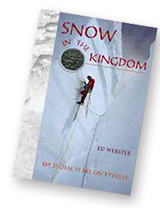 This is the story of Snow in the Kingdom, My Storm Years on Everest.